A physiology professor at the University of Arizona has received a $1.2 million grant for his work helping paralyzed patients. 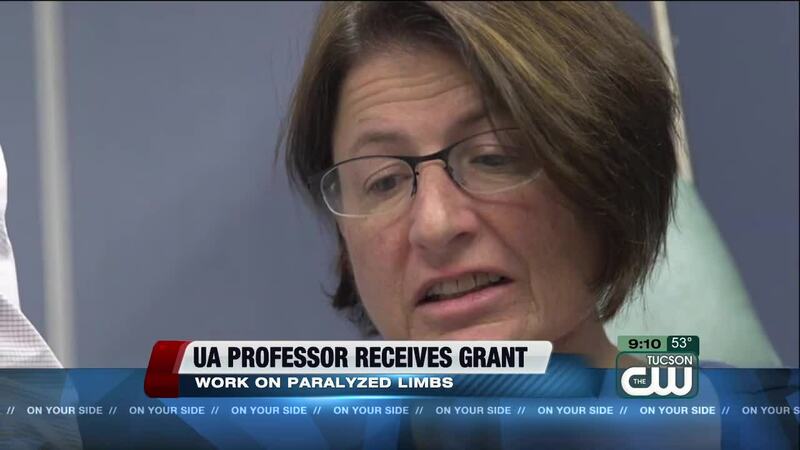 TUCSON, Ariz. - A physiology professor at the University of Arizona has received a $1.2 million grant for his work helping paralyzed patients. Dr. Andrew Fuglevand is researching the use of artificial intelligence to produce movement in otherwise paralyzed limbs. Movement starts in the brain, and when a spinal or neurological injury happens it can interrupt signals that tell certain muscles when and how to move. Dr. Fuglevand's work uses electrodes placed in paralyzed muscles to mimic the electrical signals healthy muscles get from the brain. Dr. Fuglevand's ultimate goal is to allow people with paralyzed limbs to regain voluntary control of their muscles, rather than relying on external forces or robotics to help with movement. Right now, attempts at giving the control back to patients has been unsuccessful because moving a limb requires muscles to operate in very intricate patterns. "Moving a finger involves as many as 20 different muscles at a time. Moving an arm can involve more than 50 different muscles," Dr. Fuglevand said. "They all work together in an intricate 'dance' to produce beautifully smooth movements. Replicating how the brain naturally coordinates the activities of these muscles is extremely challenging." That's where artificial intelligence comes in. Dr. Fuglevand is hoping to use artificial intelligence to learn and mimic the patterns of brain activity that control muscle movement. Then, tiny electrodes doctors have implanted in the paralyzed muscles would simply replay those signals to enact the desired movements. "If successful, this approach would greatly expand the repertoire of motor behaviors available to paralyzed individuals," Dr. Fuglevand said. The grant given to Dr. Fuglevand comes from the National Institute of Health. "The headway researchers have made in our understanding of artificial intelligence, machine learning and the brain is incredible," said UA President Robert Robbins, MD. "The opportunity to incorporate AI to brain-limb communication has life-changing potential, and while there are many challenges to optimize these interventions, we are really committed to making this step forward. I am incredibly excited to track Dr. Fuglevand's progress with this new grant."